Company founded by Mr. J. Ernest Davies as Llandeilo Builders Supplies based in Station Road, Llandeilo. The business originally started as a saw mill, converting timber from local forestry for construction, mining and manufacturing. Mr L. Michel Davies joined the company at the age of 17 after his father's sudden death and appointed MD 6 years later. Mark Davies joined the company and 6 years later takes over from his father as Managing Director, a role in which he is still in today. The company is growing and makes various acquisitions between the years of 1987 and 2002 with branches opening in Ammanford, Carmarthen, Llanelli, Ystradgynlais and Port Talbot. Relaunch of company name from Llandeilo Builders Supplies to LBS Builders Merchants in the red lozenge to reflect the growth and distribution of the branches across South West Wales. LBS voted runner-up in the Best Marketing Initiative category at the national industry awards, the Builders' Merchants Awards for Excellence. Relocation of Ammanford Branch to new purpose built site. Launch of LBS Civils Division, based out of Ammanford Branch. 2005 saw significant investment for LBS, with a number of the branches undertaking major refurbishment and expansion programmes. The yard in Carmarthen increased in size by one third, while the yard in Llanelli increased three fold to accommodate growing customer demand. Launch of Middleton Kitchens & Bathrooms with showrooms at the LBS Home Centre (Llandeilo), Port Talbot and Ammanford. 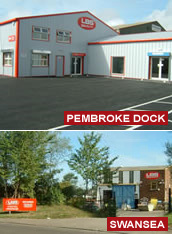 In March 2006 LBS opened the new flagship branch in Pembroke Dock, the largest investment the company has made to date, taking the LBS brand further into West Wales. LBS also opened a new branch in Swansea, forming part of the network of 10 branches throughout South West Wales. LBS managing director Mark Davies wins the award for Achievement of the Year, beating over 1500 national and independent builders' merchants from all over the UK in the national' Merchants Awards for Excellence. Launch of the LBS Loyalty Discount Card for non account / DIY customers. Opening of a further 3 branches - in Neath, and Cardigan opens in a purpose built branch with a significant investment of over Â£1m, taking the LBS brand even further into West Wales. Opened 14th merchant branch in Maesteg, taking the company further East. Significant investment is made on refurbishment of the site, increasing stck levels and updating livery on delivery vehicles. Winner for second consecutve year UK's Best Builders Merchant (6+ branches), as well as Best Customer Service and Best Trainee.